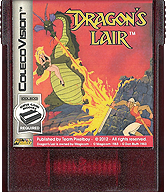 ColecoVision.dk presents: Dragon's Lair © 1983 by: Cinematronics Inc. 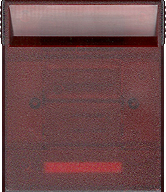 Initially © and Licenses: Cinematronics Inc., Magicom Inc., Coleco Inc., Atari Corp.
Other Platforms Releases besides This: Arcade, Amstrad, Atari, CBM, CD-i, Apple, Microsoft, Nintendo, Spectrum mm. ColecoVision Box # and Manufacturer: 13585 / 300324 Coleco Inc.
"All the action from the arcade game in your living room! " This special adaptation brings home all the excitement of the legendary arcade game and gives you even more control over the action! Lead Dirk the Daring on his quest to rescue beautiful Princess Daphne, who's been imprisoned in a crystal ball by the evil dragon. To complete this noble mission, you'll need courage and quick reflexes! Fend off supernatural forces with your sword or use your wits to escape. Swing on a rope over fiery chasms. Fight fierce battles with the dreaded Phantom Knight and cunning rat guards. Find a way to survive and you'll take on the most deadly foe of all, the diabolical dragon himself ! High Score For The ColecoVision Version Of: Dragon's Lair, Skill level: 1. 1st XName: 1st XName: 1st XName: Ole Nielsen. 2nd XName: 2nd XName: 2nd Name: Ole Nielsen. 3rd XName: 3rd XName: 3rd Name: Ole Nielsen. 4th XName: 4th XName: 4th Name: Ole Nielsen. High Score For The ColecoVision Version Of: Dragon's Lair, Skill Level: 2. Name: Name: XName: Ole Nielsen. High Score For The ColecoVision Version Of: Dragon's Lair, Skill Level: 3. High Score For The ColecoVision Version Of: Dragon's Lair, Skill Level: 4. ColecoVision.dk Game # 107, Dragon's Lair is last updated: April 11, 2019.